4/25/13 - Due to dramatic price increases from manufacturers, we reluctantly have been forced to raise our prices on this drug. Rest assured that our prices will drop if and when prices from manufacturers decline. WARNING: Methotrexate has rarely caused serious (sometimes fatal) side effects. Therefore, this medication should be used only to treat cancer or severe diseases caused by an overactive immune system (e.g., psoriasis, rheumatoid arthritis). Methotrexate has caused birth defects and death in unborn babies. Women must avoid becoming pregnant while taking this medication. Pregnant women who have psoriasis or rheumatoid arthritis must not use methotrexate. (See also Precautions) If you have kidney problems or excess body water (ascites, pleural effusion), you must be closely monitored and your dose may be adjusted or stopped by your doctor. Methotrexate (usually at high dosages) has rarely caused severe (sometimes fatal) bone marrow suppression (decreasing your body's ability to fight infections) and stomach/intestinal disease (e.g., bleeding) when used at the same time as non-steroidal anti-inflammatory drugs (NSAIDs such as indomethacin, ketoprofen). Therefore, NSAIDs should not be used with high-dose methotrexate. Caution is advised if you also take aspirin. NSAIDs/aspirin may be used with low-dose methotrexate such as for the treatment of rheumatoid arthritis if directed by your doctor. If you are using low-dose aspirin (81-325 milligrams per day) for heart attack or stroke prevention, continue to take it unless directed otherwise. Consult your doctor regarding safe use of these drugs (e.g., close monitoring by your doctor, maintaining stable doses of NSAIDs). In rare instances, this drug may also cause liver problems when it is used for long periods of time. If you are using methotrexate long-term, a liver biopsy is usually recommended. 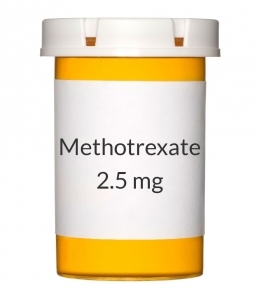 Methotrexate use has rarely resulted in serious (sometimes fatal) side effects, such as lung problems, lung infections (Pneumocystis carinii pneumonia), skin reactions, diarrhea, and mouth sores (ulcerative stomatitis). (See also Side Effects.) Lumps (tumors/abnormal growths) may very infrequently appear during methotrexate use. If this occurs, the drug must be stopped and treatment may be needed. Consult your doctor immediately if new lumps/growths occur. When used to treat tumors, methotrexate sometimes causes side effects due to the rapid destruction of cancer cells (tumor lysis syndrome). Tell your doctor immediately if you experience symptoms such as irregular heartbeat or muscle weakness. Although rare, this medication when used with radiation treatment may increase the risk of tissue and bone damage. Discuss the risks and benefits of your treatment plan with your doctor. USES: Methotrexate is used to treat certain types of cancer or to control severe psoriasis or rheumatoid arthritis. This medication works by interfering with cell growth and by suppressing the immune system. Early treatment of rheumatoid arthritis with more aggressive therapy such as methotrexate helps to reduce further joint damage and to preserve joint function. OTHER USES: This section contains uses of this drug that are not listed in the approved professional labeling for the drug but that may be prescribed by your health care professional. Use this drug for a condition that is listed in this section only if it has been so prescribed by your health care professional. This medication has also been used to treat other disorders such as lupus and psoriatic arthritis. HOW TO USE: This is a potent medication. The dose and how often you take this drug is based on your medical condition and response to therapy. There are many different dosing schedules for this medicine (especially for cancer treatment). Therefore, it is very important that you follow your doctor's instructions carefully. Take it by mouth exactly as directed. For managing psoriasis or rheumatoid arthritis, take this medication exactly as directed, usually once a week. It may take up to several months of continued use before the full benefit of this drug takes effect. Do not increase your dose or take this medication more often without your doctor's approval. Your condition will not improve any faster and the risk of serious side effects may be increased. Unless your doctor instructs you otherwise, drink plenty of fluids while taking this medication. This helps your kidneys to remove the drug from your body and minimize some of the side effects. This medication may come with a Patient Information Leaflet. Read it carefully. Ask your doctor or pharmacist any questions that you may have about this medicine. SIDE EFFECTS: See also Warning section. Nausea, vomiting, stomach pain, drowsiness or dizziness may occur. If any of these effects persist or worsen, notify your doctor or pharmacist promptly. Remember that your doctor has prescribed this medication because he or she has judged that the benefit to you is greater than the risk of side effects. Many people using this medication do not have serious side effects. Tell your doctor immediately if any of these serious side effects occur: mouth sores, diarrhea, fever, fatigue, persistent sore throat, unusual bleeding or bruising, black stools, skin rash, enlarged glands/lymph nodes, dark urine, bone pain, unusual pain and discoloration of the skin. Tell your doctor immediately if any of these unlikely but serious side effects occur: yellowing eyes/skin, change in the amount of urine, chest pain, dry cough, trouble breathing, calf pain/swelling, vision changes, irregular heartbeat, muscle weakness, mental/mood changes, seizures. Temporary hair loss may occur. Normal hair growth should return after treatment has ended. A serious allergic reaction to this drug is unlikely, but seek immediate medical attention if it occurs. Symptoms of a serious allergic reaction include: rash, itching/swelling (especially of the face/tongue/throat), severe dizziness, trouble breathing. This is not a complete list of possible side effects. If you notice other effects not listed above, contact your doctor or pharmacist. In the US - Call your doctor for medical advice about side effects. You may report side effects to FDA at 1-800-FDA-1088. In Canada - Call your doctor for medical advice about side effects. You may report side effects to Health Canada at 1-866-234-2345. PRECAUTIONS: Before taking methotrexate, tell your doctor or pharmacist if you are allergic to it; or if you have any other allergies. This product may contain inactive ingredients, which can cause allergic reactions or other problems. Talk to your pharmacist for more details. This medication should not be used if you have certain medical conditions. Before using this medicine, consult your doctor or pharmacist if you have: liver disease, severe kidney disease, severe lung disease (e.g., pulmonary fibrosis), alcohol use, suppressed immune system, blood cell/bone marrow disorders. Before using this medication, tell your doctor or pharmacist your medical history, especially of: stomach/intestinal diseases (e.g., peptic ulcer, ulcerative colitis), kidney disease, any active infection (including chickenpox or recent exposure to it), folic acid deficiency. This drug may make you dizzy or drowsy. Do not drive, use machinery, or do any activity that requires alertness until you are sure you can perform such activities safely. Avoid alcoholic beverages. This medication may make you more sensitive to the sun. Avoid prolonged sun exposure, tanning booths or sunlamps. Use a sunscreen and wear protective clothing when outdoors. Do not have immunizations/vaccinations without the consent of your doctor and avoid contact with people who have recently received oral polio vaccine. Use caution with sharp objects like safety razors or nail cutters and avoid activities such as contact sports to lower the chance of getting cut, bruised, or injured. Wash your hands well to prevent the spread of infections. Methotrexate must not be used during pregnancy. It may cause harm to an unborn baby. If you become pregnant or think you may be pregnant, inform your doctor immediately. Pregnancy must be avoided, therefore males and females must use reliable form(s) of birth control during and for at least 3 months following the end of methotrexate treatment. Methotrexate passes into breast milk and may harm a nursing infant. Do not breast-feed while using this drug. DRUG INTERACTIONS: See also Warning section. The effects of some drugs can change if you take other drugs or herbal products at the same time. This can increase your risk for serious side effects or may cause your medications not to work correctly. These drug interactions are possible, but do not always occur. Your doctor or pharmacist can often prevent or manage interactions by changing how you use your medications or by close monitoring. To help your doctor and pharmacist give you the best care, be sure to tell your doctor and pharmacist about all the products you use (including prescription drugs, nonprescription drugs, and herbal products) before starting treatment with this product. While using this product, do not start, stop, or change the dosage of any other medicines you are using without your doctor's approval. Some products that may interact with this drug include: acitretin, asparaginase, digoxin, leflunomide, live vaccines, natalizumab, other cancer treatments potentially toxic to the kidney (e.g., cisplatin), other drugs potentially toxic to the liver (e.g., azathioprine, sulfasalazine, retinoids such as isotretinoin), penicillins, phenytoin, probenecid, procarbazine, pyrimethamine, sulfa medications, theophylline. Certain drugs that reduce stomach acid (proton pump inhibitors-PPIs such as esomeprazole, omeprazole, pantoprazole) may increase the blood level of methotrexate. This may lead to a higher chance of side effects, especially with high-dose methotrexate treatment. Ask your doctor or pharmacist for details and ways to lessen the risk of side effects. Certain antibiotics (e.g., chloramphenicol, sulfa, tetracyclines) may interfere with methotrexate blood tests (increase methotrexate blood levels due to protein-binding displacement). Make sure laboratory personnel and your doctors know you are using any of these types of antibiotics. This document does not contain all possible drug interactions. Keep a list of all the products you use. Share this list with your doctor and pharmacist to lessen your risk for serious medication problems. OVERDOSE: If overdose is suspected, contact your local poison control center or emergency room immediately. US residents can call the US national poison hotline at 1-800-222-1222. Canadian residents should call their local poison control center directly. Symptoms of overdose may include severe nausea and vomiting, and bloody stools. NOTES: Do not share this medication with others. Laboratory and/or medical tests (e.g., CBC, liver and kidney function tests) should be performed periodically to monitor your progress or check for side effects. Consult your doctor for more details. MISSED DOSE: It is important to use each dose at the scheduled time. If you miss a dose, contact your doctor or pharmacist immediately to establish a new dosing schedule. Do not double the dose to catch up. STORAGE: Store this medication at room temperature between 59-86 degrees F (15-30 degrees C) away from light and moisture. Do not store in the bathroom. Keep all medicines away from children and pets. Do not flush medications down the toilet or pour them into a drain unless instructed to do so. Properly discard this product when it is expired or no longer needed. Consult your pharmacist or local waste disposal company for more details about how to safely discard your product.